Synopsis: When a secretary’s idea is stolen by her boss, she seizes an opportunity to steal it back by pretending she has her boss’s job. Review: I’m often asked for recommendations on favorite movies and I find the question to be hard to answer in a straightforward manner. Certain movies are favorites depending on my mood or because they provoke a feeling in me that I crave. Then there are the movies that work for me on any occasion, ones I will stop and watch if I see them on TV, ones that excite me to show to others. These particular kinds of movies are rare in my world but Working Girl sits high up on that list. Here is a film that, though set in the late 80s in a NYC that doesn’t exist today, still resonates and inspires with its winning cast and assured direction. It’s no secret that the 1980s represented a different mentality for much of America when it came to money. Films like Wall Street showed a darker side of the streets of NYC but the skyscrapers that set the scene for Working Girl are no less gritty. It’s right in the middle of the power suits having power lunches that we meet Tess McGill (Griffith)…the working girl of the title. Hailing from Staten Island, Tess has the drive and ambition to go far but seems to be held back by a variety of circumstances. The movie wisely doesn’t try to justify why she’s as smart as we think she is…though we do hear that she’s applied to apprenticeship programs for various Wall Street conglomerates but is stuck in red tape. Losing yet another job she lands an assignment working for Katharine Parker (Weaver), a new financial executive with an icy demeanor beneath her porcelain smile. When the two meet you can see both intelligent women sizing the other up and deciding on their next moves. When Tess shares an idea with Katharine that seems to go nowhere, she thinks nothing of it until Katharine breaks a leg on holiday and Tess discovers Katharine’s intentions to use the idea as her own. Taking on the role of an executive in Katharine’s office, Tess teams up with a businessman (Ford) to parlay the idea into a million dollar deal. Add some romantic entanglements that don’t distract from the central story and you have a movie package that fires on all cylinders. 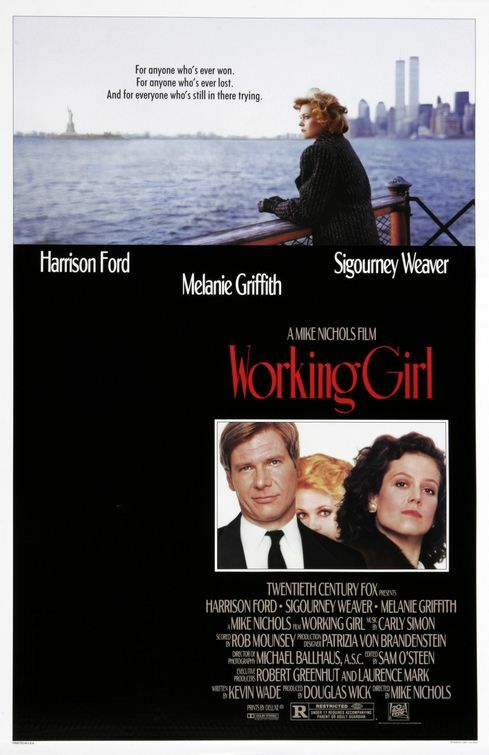 At first glance, the plot for Working Girl with its mistaken identity foibles reads like an episode of sitcom but it’s through the dialogue, performances, and unobtrusive direction of Nichols that makes this a home run. The script provided by Kevin Wade is filled with memorable lines and a focused ensemble of characters that are played by many actors that would go on to have long careers of their own (Kevin Spacey, Oliver Platt, etc). Baldwin had a pretty great 1988 considering that Working Girl was his fifth movie released that year (She’s Having a Baby, Beetlejuice, Married to the Mob, and Talk Radio were the others). Baldwin draws on his good looks and snake-ish charm to play Griffith’s cheating boyfriend. Though a minor character, the film provides him with a nice arc and a justified wrap-up that gels well with the rest of the picture. Nominated for Best Supporting Actress, Cusack is a riot as Griffith’s best friend. A working girl herself, Cusack seems more content to let her friend dream big and support her while she rises to the top. I’m pretty sure that Cusack steals every scene she’s in and even when she’s not onscreen she’s left an impression — check out the secretaries on Griffith’s floor near the end of the film and try to spot the differences in their appearance. By this point Ford was an A-List star that undeservedly gets top billing. Though his contributions are great and his playing against type is smart, this film belongs to the ladies and even he seems to know it. Ford was just moving into the stage of his career where he wanted to distance himself from the Han Solo and Indiana Jones type of roles and Working Girl was his first honest trek into lighter fare – a place he wouldn’t go to again until 1995’s remake of Sabrina. Still, his handsome presence works perfectly and he’s smashing in the role. This brings us to the two ladies that really run this ship. Equally excellent in roles that couldn’t be more perfect for them, Weaver and Griffith deservedly were nominated for Oscars for their career-high work. I don’t think Griffith has been better before or after and she’s certainly never looked as fresh as she does here. Her transition from confident big-haired New Yawk-er to confident faux executive is believable and metered enough to see that she’s learning as she goes along. While she’s always wanted this break, when she actually gets the chance to succeed she’s afraid to take it because for so long people have told her she couldn’t have it. It’s an affirming performance and one that inspires me every time I see it. What sets this apart for similar movies/television shows is that it’s not even about Griffith being a female, it’s all about status. This could have easily (but less successfully) reversed the genders with the same effect – though you know it would have been a raunchy comedy instead of a whip-smart satire. Weaver was outright robbed of an Oscar for her clever and incredibly funny turn as the wicked executive. I’m not even sure the character is a villain, actually. She makes some questionable choices, yes, but remember this takes place at a time when women executives were just coming into fashion. Weaver’s Katharine probably had to break through her own glass ceiling and make concessions of her own…still in a few key moments Weaver’s dark side is revealed and it’s equal parts hilarious and scary. I can only guess that Cusack’s nomination in the same category split the votes, sending the Oscar home with Geena Davis…but it’s hard to deny that Weaver was heads and tails better than the rest in her category. It probably didn’t help that she was also nominated as Best Actress for Gorillas in the Mist the same year. Aside from his casting and naturally effortless directing style, Nichols (who also was nominated as Best Director) brought Carly Simon aboard to collaborate on the soundtrack. Simon’s Oscar winning “Let the River Run” is the underscore for much of the film as well as starting and ending the picture. An instant battle-cry anthem for the nine-to-fivers of the world it’s a song that I go back to often when I need some verve or a way to start the day/week off right. In fact, I would say that after Dolly Parton’s “9 to 5” it’s one of the best song to get ready for work to. If you haven’t seen this film or haven’t re-visited it in a while do yourself a favor and seek it out. Working Girl is the full package – a Best Picture nominee that’s a completely satisfying film from beginning to end. The final five minutes of the film continues to choke me up — I can’t recall a movie that ends on such a perfect note and leaves the viewer feeling as if they too can pick themselves up by their bootstraps and tackle any obstacle that may be in their way. The tagline for the film really says it all “For anyone who’s ever won. For anyone who’s ever lost. And for everyone that’s still in there trying.” Indeed.